The sponge that combines the extraordinary polishing power of its refined silicone oils and the softening and nourishing power of lanoline, a waxy substance traditionally used in cosmetics to make the leather softer, moisturized, resistant and protected. Good waterproofing power which brightens and reinforces the black colour thanks to the pigments it contains. This product is also available in suede, neutral, black and for impregnated leather and skins. Polished brown leather, brushed, eco leather. Suede, untreated light leather, or "open-grain", nappa, leathers with colours other than brown, nubuck, peccary, alcantara. Calzanetto leather polishing softening and moistening treatment which acts thanks to the gradual release of the refined blend of silicone oils and lanolin contained in the sponge. 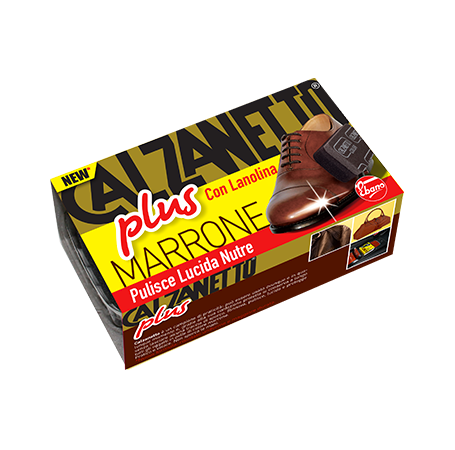 With one quick caress and without scratching the leather, Calzanetto Plus cleans, moisturizes and polishes brown footwear and accessories instantly thanks to its smooth grips.